Cell phones have impacted the way we connect with people, places and things in our world today. They impact the way in which we move through our environment and have restructured the relationships people have with others and machines themselves. I spoke with Neil Balan, a professor teaching at Laurier within communication studies, global studies and cultural studies, who partly focuses on biopolitics and discourses of security in his research, Zhenfeng Ma, associate professor of marketing and Josephine McMurray, associate professor in business technology management. I also had twelve students of various ages from a variety of university-level programs contribute their weekly screen time statistics to take a look at what their usage is like over a seven-day period. This is only a sample of students all within the City Waterloo, so this specificity should be considered when understanding the data. For myself, I got my first cell phone in 2007, when I was in grade seven. I would have been around twelve years old. For the past twelve years since then, I have constantly had my phone in close proximity. As I became more mobile and independent, I wanted my own phone; I wanted to feel like a responsible adult. This seems to be the similar social experience for Balan’s own 10-year old son in the sense that there is this status of being mature and deemed more “adult” when you have a cell phone. Realistically wherever I went there would have already been either a house phone or pay phone, something now that many people have not used in years or possibly ever in their lives. Our mobile phone use has changed what else is available and created the consistent attachment we have to these small electronic machines. The term usage is also something we need to evaluate. If someone is using their phone, does that mean they’re pressing buttons and looking at the turned-on screen or does it include having it turned on and in one’s pocket? The screen time recorded by Apple on iPhones tracts the pickups, notifications, and active time on applications, however, as I’ll soon unpack, there is an expectation of always being on-call. When asked if they had tracked their phone usage, each professor had a different response. Balan, on one hand, questioned the meaning of the term usage and how it can mean different things to different people. “I don’t formally track my usage,” Ma said. She noted the use of likely over 40 applications for various tasks, both personal and for work purposes. From notetaking, scheduling, calling, messaging, searching the internet andconnecting on social media, our phones are used for a variety of purposes across dozens of applications. The average weekly total number screen time hours from across the sample students was 28 hours per week. That means we spend over one full day per week on social media or over 55 days’ worth of screen time annually. One might question what else we could do within that time instead. Now, this is not to say that the screen time we spend on our phones is simply a waste, many people stay connected to friends, family members and perform work tasks on their mobile devices. “I notice the phenomenon that students are increasingly active on social media, which I would say is a good thing,” Ma said. One of the concerns people have is the expectation there is to be consistently accessible. I remember getting calls from my part-time job and almost guilt-tripped when I didn’t answer my phone or said that no, I couldn’t come in. I wasn’t responsible for that shift someone else could no longer make, but I was often left feeling guilty if I didn’t respond, especially in a positive way. While on vacation, people put answering machine messages that say if there’s an emergency to contact their cell phone number. We can never truly escape and fully relax. From Facebook groups to Slack channels there are a variety of ways people demand our attention through the use of mobile devices. “I know I am not physically on my phone all the time and I try to keep it tucked away in my pocket but inevitably it’s always with me and it’s probably always on,” Balan said. Balan described how full-time employment or a career would have been a way of controlling people. Now it is the cellular device and part-time and here-there-everywhere odd contract jobs where you need to be at the beck and call of someone who can reach you by said cell phone that dictate who has the power over people. “You really have to think about how having to have this thing on and being obliged to use it all the time really kind of creates a new form of control and regulation,” said Balan. There is the demand for people to consistently have their phones turned on at all hours to receive contact from work, schools or even just friends. Thinking “wow! They haven’t responded yet” in an aggravated state meanwhile its 11:30pm and they might be sleeping, is quite normalized. Both Ma and McMurray commented on their use of their cell phones to deal with research projects each of which do not have a strict working schedule. Colleagues and students alike contact Ma and he described that it is in “the nature of the professor to not stick to a strict nine to five” work day. McMurray said that texting students for research was common practice and these conversations have resulted in a blending between what would be considered after-hours and working hours. “There is so much pressure and so many different forces, powers and interests that are pushing people towards increasingly living their lives tethered to these devices and I think everyone kind of knows that. It seems like we’re really unable to sort of figure out how to decouple or uncouple from them because they just sort of subsumed us into their own logics and so far as these logics are based on ISP providers and big companies like Google to phone manufacturers,” said Balan. Our phones are often by our side every moment of the day unless we make a conscious decision to put it down and away, or potentially in another room for overnight charging. When we wake up many people, including Balan, check the news or the weather while having a morning coffee and/or eating breakfast. recognizing “that the light and just the energy and vibration from it really impacts your sleep”. At the end of the day when it is theoretically time to unplug, I keep my phone on my window sill or night table while charging. In fact, the only time I generally turn my notification sound on is when I am sleeping in order to wake me up. “These devices are designed to pull your attentions away and scatter them in different directions,” said Balan. Over the course of the day, the sample of students received an average of 196 notifications per day, and actually picked up their phones an average of 120 times. Whether ignoring the notifications in class or paying attention to other happenings, these students still may have looked over as their screen lit up. This results in at least 120 times that these students are being distracted from their non-cell phone life every day. As a professor, Balan noted that harnessing students’ attention can be difficult, but also suggests there is a benefit to having phones in a classroom setting. McMurray describes the use of technology as a whole in the classroom as an “interesting dichotomy”. “We use it ourselves and yet we don’t always allow our students to use it in the classroom,” said McMurray. an individual basis. An interesting comparison is the survey approximate submissions alongside the tracked sample data. When approximating on the survey, students submitted numbers close to the real results which demonstrates that students realise how much they are on their phones. Also, 86.2 per cent of poll respondents identified that they do not limit their screen time. We use our phones for work and play and the lines between the two seem to keep blurring more as time goes on. McMurray identified that her cellphone is the phone used for both work and personal matters. “If I have a problem in the classroom, that is the phone I use to call technical services to bring people into the classroom,” said McMurray. “How does [the phone] allow you to do things, but also how does it anchor you, tether you and kind of constrain you even though it is premised on something that is supposed to enable you and make your life way easier,” asked Balan. “The will to communicate all the time is pretty debilitating,” said Balan. Throughout the tracked students’ week, the day with the most overall usage was on Thursday for five out of 12 participants. The day with the most pickups however was Wednesday. This might suggest that in a school or work week, they have more free time to remain on their phones without having separate pickups on Thursdays and later on in the week instead of the academic and work demands of hump day and earlier in the week where the phone is put down and picked up more often. 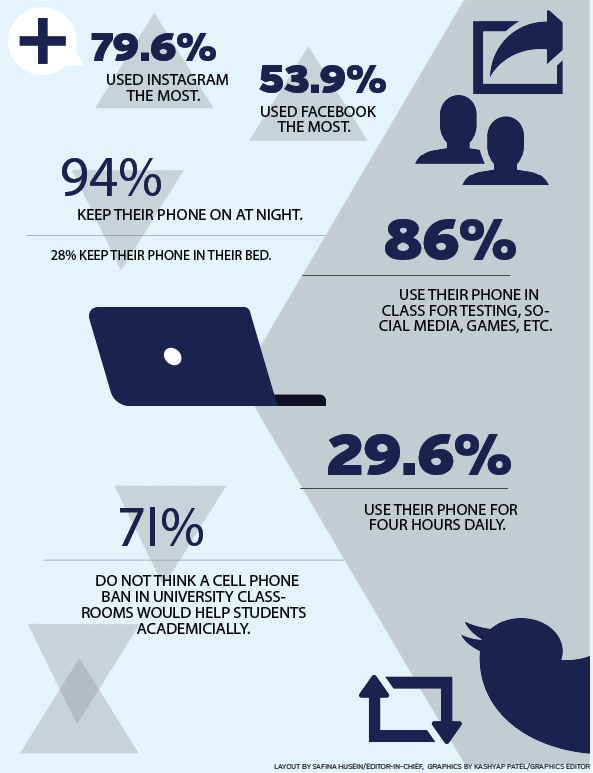 Although 83 per cent of the LSP poll respondents said they use their phone in class for non-course purposes, only half said it affected their ability to pay attention. In conclusion, I am aware that my phone is heavily integrated into my own lifestyle and other than the potential risks from chemicals and airwave signals, I am actually okay with it. I think it is important to disconnect sometimes for my eyes sake but use my phone primarily to contact other people I am not physically in the room with. The more time that passes, the more integrated mobile phones seem to be in many people’s lives, especially the younger generations as they grow up surrounded by digital technology. I would suggest to others to take a break and pay attention to how these devices can either help or hinder our personal lifestyle goals. Maybe I should reflect and take my own advice too. Author: Sarah TylerSarah is in her final year of communications studies and pursuing minors in film studies and anthropology. This is her second year on the editorial board as video editor. When Sarah is not editing you can find her giving campus tours, painting or leading Alpha Omega Sorority.